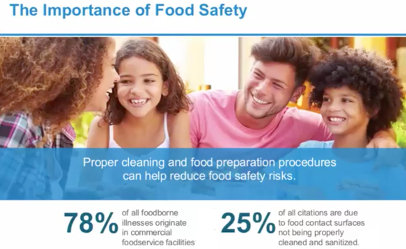 Over Ecolab’s many decades of support to the food service industry, we have seen considerable progress in the execution of sanitation and hygiene programs that protect public health. But each new food safety incident or norovirus outbreak, and the accompanying headlines, remind us that we dare not take our eyes off the ball. The public health risks continue to evolve, the stakes in terms of reputations only seem to rise and the potential for negative financial impact keeps increasing. Because we do thousands of audits each year, we know the importance of continual vigilance on the basics – good personal hygiene, safe food handling, and effective cleaning and sanitizing. In our on-site service visits, we also see emerging concerns. Consumers are asking for more local, organic and so-called clean label foods that can, if not carefully vetted and handled, present increased food safety risks. On the analytical side, advanced technologies capable of identifying pathogens at miniscule levels are contributing to public misperceptions. And social media is amplifying the risk of violations – actual and perceived. The good news is that, as the challenges evolve, new technologies also are emerging to help mitigate and manage these risks. Tools such as digital monitoring and predictive analytics are enabling greater insight and control over key risk factors across food operations 24 hours a day, seven days a week. For example, there are programs to monitor dish machines remotely, ensuring that all key metrics are achieved for optimal sanitation. However, as much as technology can help, operational excellence continues to depend, first and foremost, on human behaviors – behaviors shaped largely by culture. And this is where food service leaders have a critical role: They are in the best position to inspire a culture in which employees perform the correct hygiene and sanitation behaviors all the time, even when no one is looking. Leaders can and must demand high standards, reinforce that the public health and safety must be a top priority, and demonstrate no tolerance for corner-cutting. As employees well know, talk can be empty without action. To demonstrate the importance of proper sanitation and hygiene, leaders can invest in tools that make it easier for workers to follow best practices. They can provide continuous training to reinforce key behaviors. They can conduct audits of their operations – and use the findings to build on good behaviors and highlight areas for improvement. And they can recognize high-performing teams and celebrate their vigilance. The cost of not fostering a culture that supports food safety and public health strikes where it hurts: The bottom line. National Restaurant Association studies show that, after a food safety incident, food service companies experience, on average, a double-digit decline in sales and per-establishment costs of $75,000 for legal fees, medical claims, lost wages and sanitizing costs. That does not include the high price of damage to a company name or brand. Careful attention to sanitation and hygiene clearly is a key factor in the success of any food service organization – a factor upon which leadership can exert considerable influence.